Nokia has added another smartphone to its line up with the launch of the Nokia C5. The Nokia C5 is the first mobile phone in a new range of mobiles from Nokia called the ‘C’ series. The Nokia C5 runs the Symbian OS, and it features a 2.2 inch screen, and comes with a 3.2 megapixel camera. It comes with Nokia’s free navigation application, Ovi Maps. 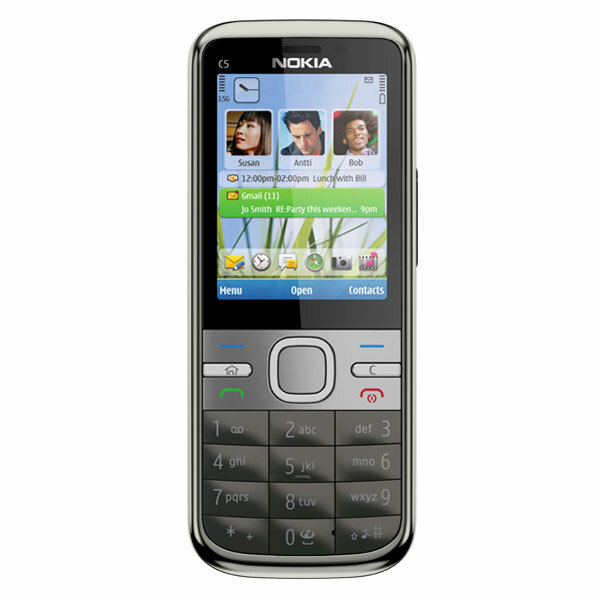 Other features on the Nokia C5 include a phone book that allows you to see your friends and contacts Facebook status’s as well as send them messages direct from the phone book. The Nokia C5 features a microSD card slot and it can take microSD cards up to 16GB, it comes with a 2GB microSD card. The Nokia C5 measures 12mm thick, and stands 46mm tall and is 112mm wide. Battery life is reported at twelve hours of talk time on a single charge. The Nokia C5 will be available in Europe in the second quarter of 2010 for 135 Euros about $182.